The Settings or Options command in Bricscad allows you to control the operating parameters and drawing settings. The Bricscad Settings command dialog box: Find all that you need even if you don't know where it is located. 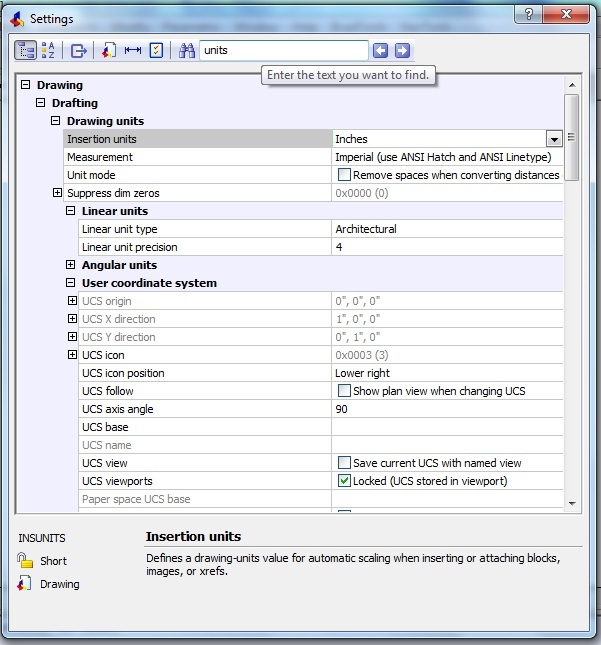 The Settings command provides a very comprehensive dialog box that offers a collapsible tree-structured environment that allows virtually every drawing presentation and internal system variable to be controlled. However, it may not be easy for the first-time user to locate precisely the exact setting that they want to change. In this post, I will show you how you can do a lot with this command even if you are not familiar with the Settings dialog box and do not yet know the exact locations of your favorite drawing settings. The most important feature in this dialog box that I am going to write about today is the Search window. In this Search window, you can type a term representing the drawing feature, variable or item you want to look up and it will be highlighted immediately in the tree structured view below. For example, I typed viewport in the search window and I see that the first match is already highlighted and brought to focus. I can now click on the right arrow button next to the search window and have Bricscad shows me all subsequent matches for the viewport string. You will now notice that the matches are not just from the variable names and titles but also from the help content for each item that appears at the bottom of the dialog. If you do not want to include the help content in your search match, you can click on the binoculars icon next to the search window and un-check the last item, which is In Variable help. If the In Variable Help button is un-checked, you will get the results matching only the variable titles and contents. This is probably more practical, realistic and more predictable than using the default Bricscad setting of including the help content also. The beauty of this search feature is that it makes your task of finding your settings parameters easy. It is like having 'Google' inside your Settings dialog. And that is indeed very nice because you cannot be expected to remember and navigate through dozens of collapsible tree menus to locate your drawing settings. The purpose of writing this post is to explicitly ask you to try the Search feature. A similar feature does not exist in the AutoCAD Settings dialog box. And you would not expect it in Bricscad either. 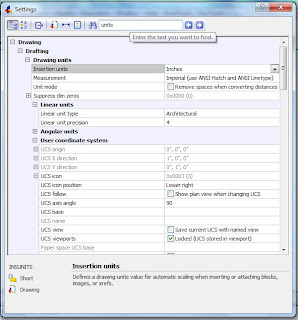 So, go ahead, use it and you will realize that it is much easier to locate that deeply nested dimensioning control variable or viewport settings without much difficulty. Fixed-seats licensing of GeoTools/CADPower is made based on two types of computer identification methods - either a disk based appkey or MAC-address based appkeys. The appkeys are short for application keys and are nothing but a series of numbers that represent a unique code to identify your computer. In the case of a disk-based appkey, the serial number of the primary hard disk is used while in the other case, the Media Access Control (MAC) address is used. Both methods are quite reliable and have been in use for the past many years. However, there are certain situations when either one may not work correctly. For instance, in the case of disk-based appkeys, we noticed that computers which did not have a primary hard disk as the fixed hard disk, or those which were configured as pure virtual disk drives did not produce a valid disk-based appkey. In such a case, it is required to use MAC-address based appkeys. Even MAC-address based appkeys can sometimes fail. This can happen under some conditions where the MAC-address is composed of only one token of address. Normally, the MAC-address returns a number containing 2 or 4 tokens of addresses, each containing 6 codes, making a total of 12 or 24 codes respectively. Depending on the network status, whether connected or not, the MAC-address varies. Our software requires a match of atleast 2 tokens for the license test to pass. We noticed that there are some instances where the MAC-address produces only 1 token. Although the software licensing mechanism can be programmed to accept the match of only 1 token, we have set it to require a match of atleast 2 tokens for the license match to succeed. This is because of security reasons. If your MAC-address produces only 1 token of address code, you cannot use MAC-address licensing and must switch to disk-based appkeys. We cannot predict what kind of MAC-address code your computer may produce. This post helps you identify what to interpret out of the appkeys your computer has produced when your run the CP_APPKEY or GT_APPKEY command in CADPower and GeoTools. In fact, the appkey dialog box (shown above) shows both disk-based and MAC-address based appkeys. You can send both to us and we can decide which of it to use for a successful licensing of our software on your computer. I hope this post will enlighten our GeoTools/CADPower users about some licensing mechanisms, their strengths and limitations. As you can see, along with the floating network license, we have vastly improved the licensing technologies used in GeoTools and CADpower now. One of the new features in the V 12.21+ release of GeoTools and CADPower is the support for a floating license which is served over the network. How does the floating license work? This post explains how it all works. Until now, the regular licensing mechanism was based either of computer-based appkeys or the CAD serial numbers. This method ties the license to the computer or the copy of AutoCAD that is running. The folder on each computer where GeoTools/CADPower is installed. The master license file stores encrypted information about the number of users that can use the software simultaneously. It also stores the location on the network where the file must be placed. These two pieces of information are encrypted and pre-stored in the file by us. You must use a similar syntax shown above to specify to us your floating license master file location. But, as you would rightly have guessed, the N drive must be mapped thus in all the individual computers. Our floating license is based on a very simple mechanism which is entirely Lisp-based. Once you decide you want to use a floating license of GeoTools/CADPower, simply tell us the exact location of the folder on your network where you will store your master license file. We will create a license file for you with the folder name and the number of users written into the license file. You copy the license file to the specified folder, and, additionally, also keep a copy of the same file on your local computer in the folder where you have installed GeoTools/CADPower. When GeoTools/CADPower starts, it reads your local license file first, determines the location of the master license file and reads it. The number of allowed simultaneous use of GeoTools/CADPower is now known and this is kept track of internally in a license transaction file. Each time, a user logs in to use GeoTools/CADPower, a new license is issued (check-in) from the available licenses. When they log out of GeoTools/CADPower, the license is returned (check-out) and can be used by another user. What happens during a crash of your CAD software? When AutoCAD or Bricsad crashes, the license is not returned and will still be reported as "in-use" by the crashed computer. Such licenses can be returned or reset by simply starting GeoTools/CADPower again on that computer and exiting. As long as there is a normal exit of your CAD software at any time, the license will always correctly check in and out. How is a user determined? The floating license mechanism uses the computer name as the key to determine that a new user is requesting a license. Therefore, you cannot have two computers on your network with the same name. It will cause a conflict. Even Windows networking does not work correctly if there are two computers sharing the same name on the network. How do I know what kind of licensing I have? You can go to the More Options sub-menu in your GeoTools/CADPower menu and click on License Info. This is how the license information screen looks like (see above). We have not yet announced a network license pricing, but we intend to do that in the future soon, and the cost of a network license of GeoTools/CADPower will be more than a regular stand-alone license. As of now, the network license costs the same as the regular stand-alone licenses. In my last post, I explained the procedure to be followed to ensure that GeoTools and CADPower run side by side on the same computer on Bricscad. In this post, I will explain how it is to be done in AutoCAD. The procedure is almost similar, only a few file names change. First, install GeoTools for AutoCAD and CADPower for AutoCAD in the usual way into their own respective folders. At the end of the installation, you see a dialog box that pops up and asks you to do a small configuration step. Follow the instructions and do as it says. You will need to add both the CADPower folder as well as GeoTools folder in the Support file search path under the Options command -> Files section. Earlier, you were advised to move the folder to the top of the list. You must still do that and you will end up with GeoTools and CADPower folders as the top/first two folders in the list. Now, comes the catch. The starter file which fires CADPower or GeoTools is called acad.lsp and resides in the respective folder of each software. ;; | automatically upon startup in CAD. ;; | automatically upon startup in AutoCAD. To give you a little background, these statements are just function calls to load the GeoTools or CADPower executable which is a .VLX file. These functiona reside in a file called GT_LOAD.LSP (for GeoTools) and CP_Load.LSP (for CADPower). Now, the problem is that your AutoCAD can see only one acad.lsp per session and load it. Obviously, it "sees" and "reads" only the first acad.lsp file from the list, which is the top/first item in the folders list. And that could be the acad.lsp from the CADPower folder or the GeoTools folder, depending on which is at the top of the list. So, the second acad.lsp in the list never gets loaded and therefore only one of either CADPower or GeoTools is loaded. The solution is very simple - simply copy the contents of both the files into one single acad.lsp file and that file must reside in the folder which is mentioned first on the list. This ensures that both the software get loaded and can be used alongside each other. With the old GeoTools splitting and giving birth to the new GeoTools and CADPower, there is one question that every one is asking - How to use GeoTools and CADPower on the same computer together? In this post, we will explain how to do it in Bricscad. First, install GeoTools for Bricscad and CADPower for Bricscad in the usual way into their own respective folders. At the end of the installation, you see a dialog box that pops up and asks you to do a small configuration step. Follow the instructions and do as it says. If you want to know more about this step, you can also read one of my old blog posts titled How to Configure GeoTools For Bricscad?. Although it is an old post explaining about GeoTools, the process is exactly similar and valid for CADPower also. You will need to add both the CADPower folder as well as GeoTools folder in the Support file search path under the Settings command -> Files section. Earlier, you were advised to move the folder to the top of the list. You must still do that and you will end up with GeoTools and CADPower folders as the top/first two folders in the list. Now, comes the catch. The starter file which fires CADPower or GeoTools is called on_doc_load.lsp and resides in the respective folder of each software. To give you a little background, these statements are just a call to load the GeoTools or CADPower executable which is a .DES file as you can see. Now, the problem is that your Bricscad can see only one on_doc_load.lsp per session and load it. Obviously, it "sees" and "reads" only the first on_doc_load.lsp file from the list, which is the top/first item in the folders list. And that could be the on_doc_load.lsp from the CADPower folder or the GeoTools folder, depending on which is at the top of the list. So, the second in the list on_doc_load.lsp never gets loaded and therefore only one of either CADPower or GeoTools is loaded. The solution is very simple - simply copy the contents of both the files into one single on_doc_load.lsp and that file must reside in the folder which is mentioned first on the list. Often, users ask me how to add a new hatch pattern in Bricscad. The procedure is easy but not well-documented or straighforward. This post explains how to do it. If you want to add a new hatch pattern, which will become available by default when you start Bricscad, you must add it into the .PAT file. In AutoCAD, the main (or default) hatch pattern file is called ACAD.PAT while in Bricscad, it is called as DEFAULT.PAT for imperial units hatch pattern and ISO.PAT for metric units. Any new hatch pattern that you want to add must be added to these files manually using a text editor. To create a new hatch pattern, you must copy the hatch pattern info from another .PAT file to the DEFAULT.PAT file of Bricscad. For example, the Bricscad .PAT file does not contain the SWAMP hatch pattern that is found in AutoCAD. To make this available in Bricscad, open the ACAD.PAT file (in a text editor) and copy the block of text representing the definition of the SWAMP hatch pattern, and copy-paste the same into the DEAFULT.PAT file (for imperial units) or ISO.PAT file (for metric units) in the Bricscad folder. Make sure you copy the files into both the locations shown above (as applicable on your computer. Actual paths may vary depending on where you have installed Bricscad). Once you have done this, restart your Bricscad and you should be able to access the newly added hatch patterns in Bricscad. The above image shows the HATCH command in Bricscad with the SWAMP hatch added. Please do give me your feedback and let me know if this article was helpful to you. Four Dimension Technologies and Coordinate Systems are pleased to announce the release of CADPower - our new general purpose productivity tool for AutoCAD and Bricscad. Today, we also re-launch GeoTools in its new avatar, containing tools which are required only for the geographic, mapping and civil/survey CAD users. The latest builds of these software have been given version number 12.21, which is the next update after 12.20, which was the last released version of unsplit GeoTools. The purpose of this split and the re-branding exercise has been to make the two products address their target markets in a clear manner without causing confusion. During this process, we are also re-designing our web-sites to make it simpler and easier to use and navigate. It has taken us this long to get all the ducks in a row and ensure that the products are stable enough for a release. There may be still be some areas in the product code-base and on our web-site/documentation that needs polishing. We will be working on this tirelessly to ensure that you have a pleasant experience using these products. Your feedback and constructive criticism are most welcome, as always. For those of you who are reading about our products for the first time, here is the background info. GeoTools has been in existence since 1999 and contained over 275+ tools for general CAD productivity and many specifically for geographic CAD data users. It ran on both AutoCAD and Bricscad platforms, and enjoyed a user-base of over 1000+ distinct customers in about 35 countries. Now, we have split the tool collection into a pure-GeoTools software and the rest into CADPower - for the general CAD users. GeoTools contains mainly only those CAD tools that typically surveyors, mapping professionals, GIS-CAD data users and other geo-data users would find useful. For instance, you will not find tools to do CAD file management, multiple DWG formats, batch processing and so on. Pure CAD productivity tools that are of interest to ALL CAD users have been shifted to CADPower. For instance, you will not find Civil, AutoCAD Map and Drawing Cleanup tools in CADPower. There are some common tools which are available and repeated in both GeoTools and CADPpower. Many GeoTools users may find CADPower also very useful, because general CAD management tools are required for everyone. In such cases, you are advised to purchase both GeoTools and CADPower. What's new in GeoTools and CADPower? Support for network/floating licensing in case of a multi-user license environment, in addition to the existing methods (long standing user request). Long pull-down menus have been further classified and bunched into sub-categories. This will make it easier for you to locate your favorite commands and remember their locations as well. In short, we have taken one big step to remove the clutter of commands that hits the eye, especially when you are dealing with Polyline, Blocks, AutoCAD Map and Miscellaneous Tools (again a long standing user request). Support for online license verification through internet (makes license management easier). We hope that the single biggest feature of these software is that it is going to be easier to use than before. Full support for MAC-address based appkeys. The MAC-address based appkeys have been now tested thoroughly under various network conditions and is more reliable than ever. Although disk-based appkeys are still available, users are encouraged to provide us with MAC-address based appkeys. A single user license of GeoTools will now be USD 129. A single user license of CADPower will now be USD 109. If you require both CADPower and GeoTools, a combo price of USD 219 is possible. These are promotion prices, and expected to be in place atleast until May 2012, when the next release, V13 will be out. Bricscad users in India will now get a license of CADPower free with every purchase of Bricscad from us. GeoTools will no longer be available free for Bricscad purchases in India (except if provided by special arrangement). What are your advantage now? With the 275+ tools split up into two products, each with is own focus, you now can expect better value for your money depending on what exactly you want. You now have to choose to purchase either GeoTools or CADPower or both because you now know what exactly you will get in either of them. For the general CAD user, CADPower offers better brand recall and understanding of what it provides, rather than a GeoTools which seems to suggest only geo-related tools. GeoTools 12.21 / CADPower 12.21 and later will be supported on AutoCAD versions 2007 onwards until 2012. Support for AutoCAD 2004, 2005 and 2006 has been dropped. Under Bricscad, GeoTools/CADPower 12.21 and later will be supported on Bricscad V 12.1.15.1 and later only. The software may not work correctly on earlier builds of Bricscad v12 because of some new floating licensing API functions that have been specifically created for GeoTools/CADPower and available only in 12.1.15.1. GeoTools and CADPower generate the same appkey for the computer where it is used but the license file for each of these will be different. The file naming convention is same like before - GeoToolsUser12_EN_AC.rgs is the name of the license file for GeoTools V12, English version for AutoCAD. CADPowerUser12_EN_AC.rgs is the name of the license file for CADPowers V12, English version for AutoCAD. Existing users of GeoTools V12 will receive a free license of CADPower V12 for the same appkey to which the GeoTools license is issued. If we have not yet been able to reach you by email/phone, please drop us an email and request your CADPower V12 license. Existing users of GeoTools v12 can continue to use their existing GeoTools V12 license file with no change. Existing users of GeoTools v12 can continue to use the old unsplit GeoTools product if they like but there will be no further updates to that product. All new commands, enhancements and bug fixes will now appear on the new product only. We have lots of ideas and plans for the future. The first and foremost immediate task is to ensure that the two products run smoothly and deliver on their promise. Next, we will start adding new features to these products, some of which we already did in this build or is work-in-progress. In particular, we plan to add many new features in CADPower for general CAD productivity for the Bricscad user, with a goal to make Bricscad an even more attractive platform to use. We will also strive to fully support all the new object types in AutoCAD like dynamic blocks, sheet sets etc and make our products comfortable with these data types. We will continue to provide tools for the CAD user to work smarter and not harder in the chosen CAD environment - AutoCAD or Bricscad. The software is available in all three operating languages - English, Spanish and German. While English and Spanish have been fully translated and complete, the German version still has some areas of user-interface in English. This will be fixed shortly. We have a lot more to tell and show you about these products. All of it is not possible in this post. Stay tuned for more info and activity on our blog and through the newsletter.